Want to be an Optimum Millionaire? When you spend $10 or more from now until February 27. 2015 you will get a contest card with a pin to enter! You also get 3 free spins everyday just for signing up. 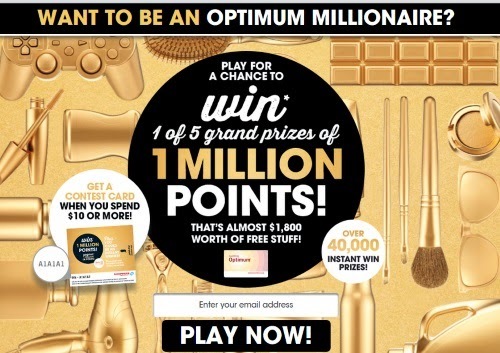 You can win 1 of 5 Grand Prizes of 1 million Optimum points (equal to almost $1800 worth of Free Stuff) and there are over 40,000 instant win prizes. Click here for the 2017 edition of this contest. Click here for the 2016 edition of this Shoppers Drug Mart Millionaire Contest. Click here for the 2016 Spring edition of this contest. Great for shoppers, everybody win! The website for the contest is not very friendly. What a waist of time!! Every contest I go through this, filling out the form and get nowhere with it. Can you be more specific? I've entered like 5 contest cards already this month and had no trouble. How on earth do I enter.? Where is the form? Why so difficult. Surly all these young guys you have doing this, can make a contest to do easier. Have my card with the pin number!! The pin code is entered where it says "pin codes 0/28 pin entered" on the game board at the link. I agree.Where do you enter the pin from the card to enter the contest?????? I can't enter pin code for you, I am not Shoppers Drug Mart and the Shoppers Drug Mart site is not mine. I also recycle my contest cards, so it's not a waste of trees. Where the heck do i put the pin number !!!!!!!! Under the pin codes section on the game board. I was able to enter the PIN code without a problem. I watched the videos for more chances to play.......My PROBLEM is that I was supposed to receive entries for loading coupons onto my card and THAT didn't give me anything?!?! It takes 24 hours usually to see those extra entries after adding coupons. You don't, this post is from 2015. We have a link above to the current 2016 contest. So many idiots! I've had absolutely no issues entering my Pin#s and spinning the Wheel; probably not the Website that is the issue but the person trying to operate their computer. Instead of complaining please ask someone for Help! I managed to win well over 300 entries for the Grand Prize, so my fingers are crossed that someone faithful enough to the Contest wins the Million Points! Next time follow the instructions a bit better and you just may be able to play!